Eating raw doesn't need to be time consuming nor complicated! With spring here its time to get those graters out & enter the world of fresh raw salads! 1. Boil your quinoa in rapid boiling water for around 15mins. 2. Rinse under cold water & strain. Let sit for 5mins to cool. 3. 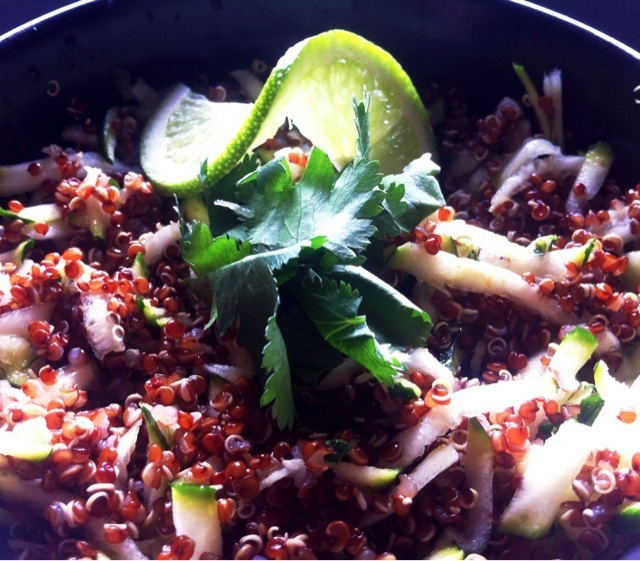 Grate your zucchini & mix into the quinoa. 4. Chop up our fresh coriander & add into the mix. Stir through & squeeze your fresh lime over the mix. 5. Add your extra virgin olive oil with an all natural or organic moroccan spice blend & mix through. I use herbies spice blends, available from all good healthfood stores.